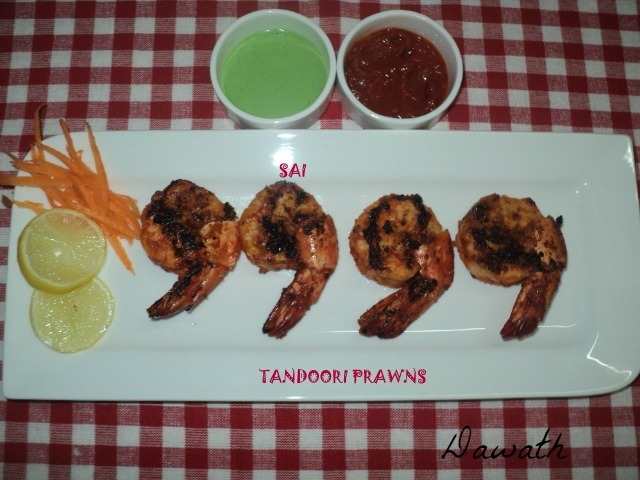 Tandoori prawns is one my favourite seafood starter.Whenever we visit restaurants I never miss out to order this special dish.In Mangalore we get best tandoori prawns in many restaurants like Palkhi,Maharaja and now it is my place I bet.In this recipe few batches I grilled in a grilled pan and few in an electric grill.This is a Dil Maange more dish which means you will ask for more and more, irresistible dish.Cooking seafood and rice dishes has always been my forte.Will be featuring more dishes in the coming days,until then stay tuned. Apply salt and lime juice to the prawns and let it sit for 20 minutes. Mix all the ingredients under marinade and marinate it to the prawns. Thread the prawns onto the bamboo skewers and refrigerate for 2-3 hours or overnight. Heat a grill pan,add ghee and grill the marinated prawns on both the sides until it gets cooked and brown in colour. You may also grill it in a oven. If you are grilling it in a grill or an oven baste it butter or ghee before grilling and between intervals. if I cook in oven what temperature should it the oven be on??? I have tried only in an electric grill, barbecue and tawa.You may keep it in grill mode at 150 C for 15 mts, and check between intervals.